Some of that world-renowned St. Olaf College vocal talent will come down off the hill and into the valley this Friday night. 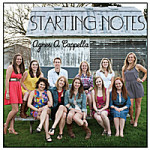 Following up on their performance for the Board of Regents, Maria Coyne and Rose Dennis, members of the popular Agnes a Cappella group. will be performing in rather more informal digs. Friday, November 1st: Maria Coyne & Rose Dennis, 5:00 to 7:00 p.m., Contented Cow; Danse Macabre, 7:00 p.m., Arts Guild Theater; Opening Reception – Mixed Messages: Twentieth Century Chinese Prints; 7:00 to 9:00 p.m., Flaten Art Museum on the St. Olaf College campus; Movember Kick-off Party, 7:00 to 9:00 p.m., Contented Cow; Twelfth Night, 7:30 p.m., Weitz Center on the Carleton College campus; Ben Aaron, 8:00 p.m., Tavern Lounge; Pianist Sandra Joy Friesen, 8:15 p.m., Urness Hall on the St. Olaf College campus; and Unknown Tactics, 8:00 to 10:30 p.m., Contented Cow. Saturday, November 2nd: Fresh Space, 2:00 p.m., Dittmann Center Dance Studio One on the St. Olaf College campus; Elizabeth Barnes, 5:00 to 8:00 p.m., Contented Cow; Apostle on the Edge, 7:30 p.m., Haugen Theater on the St. Olaf College campus; Twelfth Night, 8:00 p.m., Weitz Center on the Carleton College campus; Sasha Mercedes, 8:00 p.m., Tavern Lounge; and Bonnie & the Clydes, 9:30 to 11:30 p.m., Contented Cow. Sunday, November 3rd: Apostle on the Edge, 2:00 p.m., Haugen Theater on the St. Olaf College campus; Twelfth Night, 2:00 p.m., Weitz Center on the Carleton College campus; Jazz Ensemble Concert, 3:00 p.m., Concert Hall on the Carleton College campus; Choral Day Concert, 4:00 p.m., Skoglund Center Auditorium on the St. Olaf College campus; and Quiz Night, 8:00 p.m., Contented Cow.